A suspected meteor lit up the skies of north east Scotland and triggered panicked phone calls to the police. 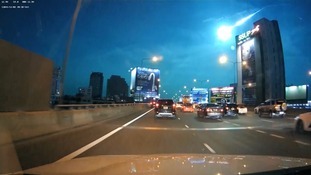 A dashboard camera has captured stunning footage of what is thought to be a meteor lighting up the sky above Bangkok. Freezing clear conditions allowed those who dared venture out a dazzling display of the Geminid meteor shower. Footage taken by a car's dashboard camera in the Russian city of Murmansk shows what appears to be a meteor-like object flying across the night sky. A 10-ton meteor exploded in the sky over the Chelyabinsk region of Russia in February last year. Hundreds of people in the Midwest reported seeing a large fireball in the sky on Thursday around 5:35pm local time (2335 GMT) and the image was caught on tape by a security camera in Iowa. According to the City of North Liberty's website, on Friday "Assistant Streets Superintendent Dan Lange discovered that a security camera at the public works facility on S. Front Street captured the falling object." The tape shows a fiery object streaking across the night sky. The American Meteor Society says that it has received over 700 reports of a fireball over the border of Iowa and Minnesota. 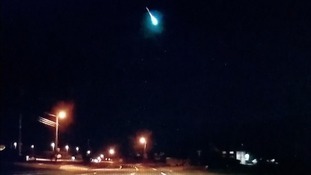 AMS says witnesses reported an object "as bright as the Sun that fragmented into many parts" as well as several reports of "sonic effects associated with the meteor." A meteor that exploded over Russia in February was "a wake-up call" for humanity, according to scientists studying the event. 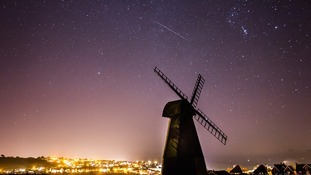 The Royal Astronomical Society believes 2013 could be the year up to 60 shooting stars an hour fall from UK skies thanks to the annual Perseids meteor shower.